I am the type of person that likes to start a process at the beginning and follow through to the end. So when I started thinking about how to help someone develop a financial plan, I couldn’t let myself go directly to the planning stage without first going through the ‘get organized’ and the ‘find out where you stand now’ stages. So, I searched the Google web and reviewed ‘umpteen’ financial planners and organizers. I decided which features I liked best and consolidated them into one. 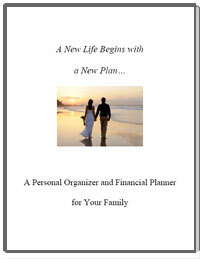 The result is “A New Life Begins With A New Plan”, our 54 page financial planner and organizer. I’m sure that as time goes on I will add more features and updates to the organizer as well as tips and suggestions, but for now you can download our organizer free; no strings attached. Anyway to get your free organizer and planner, just go to http://www.getfinancialadvice.com/request-free-financial-planner.html. Enjoy!